Cycling is great for everyone! Thousands of residents in Windsor and Essex County ride bicycles because it’s convenient, healthy, inexpensive, and fun. Our Guide to Cycling in Windsor and Essex County will teach you about your bicycle, our traffic laws, and how to cycle safely. Whether you’re riding on the road or a multi-use trail, always remember to use your best judgement, take your time, and have fun! Thanks to the Ontario Trillium Foundation for generously funding the creation of this handbook, and to Cycle TO for sharing their guide with us. Printed copies are available at the Windsor Public Library and City of Windsor Community Centres. If you’re interested in more printed copies, please email us. We are working on producing the guide in other languages. 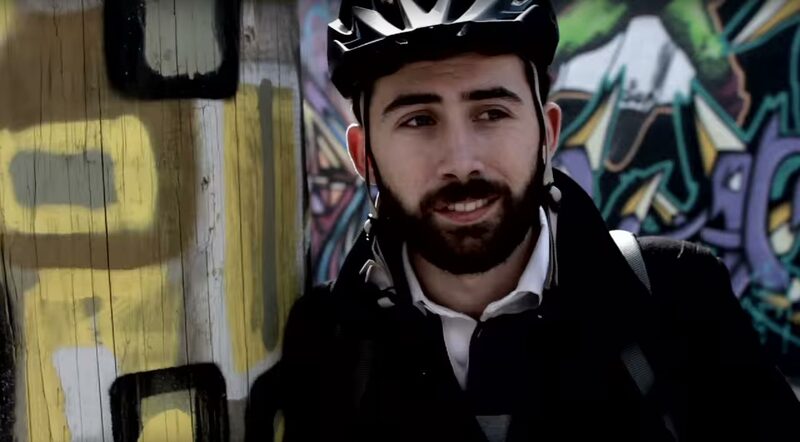 In 2013, Bike Friendly and The Safety Village partnered to create a local cycling safety video. Check it out above! For more information on how you can keep yourself and others safe, simply scroll down to find the information you’re looking for. We all bike for different reasons, whether as a means of transportation, a way of getting exercise, or simply as a leisure activity. Whatever your reason for riding, we want you to get home safe. Just like any other vehicle, it is your responsibility as the operator of that vehicle to ensure that you and those around you remain safe. Before you hop on your bike, know the rules and best practices that will keep you riding. As a cyclist, you are responsible for knowing the same rules of the road as the operators of motor vehicles, though with some exceptions. For example, you do not need a licence to operate you bike on a roadway, however you also cannot ride your bike on controlled access highways such as the 401 or Windsor’s E.C. Row Expressway, and you must walk your bike across intersections that have a pedestrian crossing. There is of course plenty more to know than just that though. You can find Ministry of Transportation expectations of cyclists here, or download their complete cycling skills guide PDF. Don’t forget to check out our Learn to Ride and City Street Riding Classes. So much about being safe depends on preparation. Always make sure that you bike is in good working order before hopping on. Make sure the chain is well oiled, your brakes are working, your tires are properly inflated, and that any quick releases, such as those for adjusting your seat are tight and secure. If you’re riding at night, make sure all of your reflectors are properly attached and that you have working bike lights for the front and back of your bike. Speaking of riding at night, be sure to avoid wearing dark clothing. You want to be visible to others on the road, so if possible, wear reflective gear and bright-colours. Closed-toe shoes are recommended. Finally, make sure that you’re wearing a properly fitted helmet. If could save your life. Like with any road trip, it is important to know where you’re going and how you’re going to get there. Whenever possible, try to plan your route, especially when riding on public roadways or through busy neighbourhoods. Don’t forget to consider how long your ride will take, and what time you’ll be at your destination so that you avoid unplanned rides during the night. Using tools such as Google Maps that actively suggest safe routes can be an excellent way of ensuring that you get to your destination on time, and in one piece. Here is an excellent article on how to make the most of such tools. The only person you can rely on while sharing the road with others is you. When riding, make sure that you are always looking at what others might be doing. Mistakes are often made when surprised or panic, and by anticipating the actions of others, you may just safe your own life. Make sure you look ahead while keeping your head on a swivel. Watch for debris, sewer grates or other obstructions well in advance so that you can take appropriate action. Be careful of parked cars in order to avoid riding into a suddenly opened door. Always look around you to check for other vehicles or pedestrians before making a turn or pass. In the same vein, try to be predictable yourself. Always signal before making a turn or pass, and avoid knee-jerk reactions when possible.